This summer, I am trying to really focus on picking and eating healthy snacks that will fuel my body until the next meal, curb the cravings and be without all the icky ingredients found in a lot of snacks. I definitely have bad days where I fail at this but lately I have been doing really well because I carry around TrueNorth snacks! It's a simple snack that you can count on this summer for real energy to fuel your day. I definitely get a lasting energy boost during the day with these lightly sweet and bite-sized, fresh roasted nut clusters. TrueNorth snacks are made thoughtfully from simple ingredients to create a surprisingly delicious snacking experience. I think what I really like about TrueNorth is that it allows me to enjoy the best of both worlds: it's a snack that's good for me and fills a hunger gap, while still satisfying my sweet and crunchy cravings. With TrueNorth in my cupboard, I don't reach for the chocolate bars or potato chips anymore - I get both sweet and salty in my TrueNorth snacks! These nut clusters are available in three flavors: Cashew Crunch, Chocolate Nut Crunch and Almond Pecan Crunch. The flavors specifically include the best nuts for your diet, helping to keep you full and suppress your appetite. Made with ingredients you can recognize, TrueNorth nut cluster snacks are always free of artificial colors, preservatives, trans fats and have no cholesterol. TrueNorth lightly sweetened nut clusters really are the perfect take-anywhere snack that satisfies your hunger and gives you a real energy boost to fuel your day. It really is a great summer snack for the car, in your purse or at the beach! Take it anywhere and snack smart with TrueNorth! 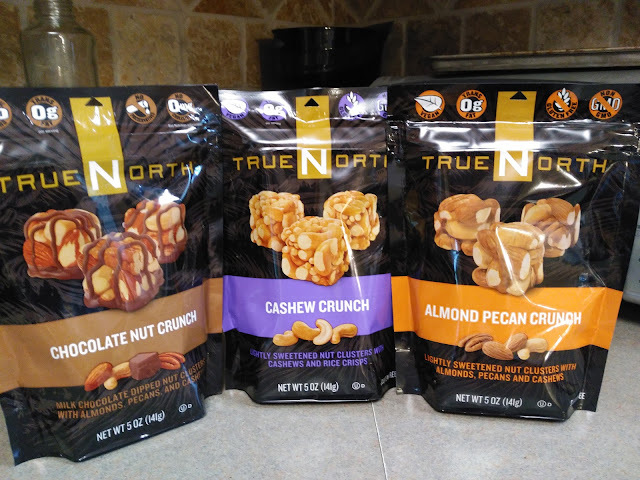 You can purchase TrueNorth snacks at your local retailer. TrueNorth is generously offering TWO bags of each flavor (totaling 6 bags!) to a lucky winner! My "enter other giveaways #3 was supposed to say Yasso Frozen Greek Yogurt. I thought i copied and pasted that, but i pasted a twitter tweet link instead. Oops! Sorry about that.